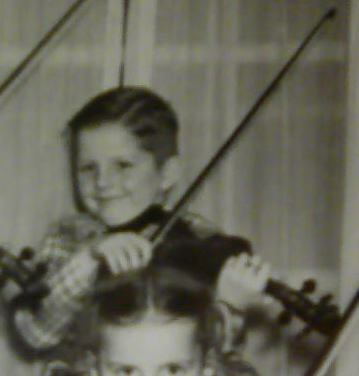 Help me identify this violin! Was given an old violin and I know nothing about it. So I got this old violin it looks like it's been through hell and back. There are no markings or labels on the inside or anywhere on this violin. It seems very old and is definitely handmade, it might just be an old homemade violin. The symmetry of the scroll head stocks sides are off as are the f-holes and curves of the body. And the high tuners seem original and definitely hand carved, as the lower ones have been replaced. If y'all know or could tell me anything about this violin I would be so happy. @dk69: Definitely an old hand made piece. I don't think there is anyway to identify the maker, but by it's looks, I would say the maker is probably not with us anymore. Thanks for the post and photo's. I'd be interested in what it sounds like. You probably / maybe should take it to a luthier ( if you're able to do that ) and have it checked out, then put it back in playing condition. Ohhhhhhh,,,, and welcome to the FM forum. Also, I'd be curious as to how much it weighs? If it's too heavy (looks thick, no cracks) it might not sound that great once you set it up, though it could be fun to have it put back into playing condition just the same. Can you measure the back of it as well? Wondering if it's full size. I would definitely hang it up on a wall at the very least. It is definitely a very old handmade violin. I agree with Fiddlesitx and you should take it to a luthier to get it checked out. My mom gave it to me I don't where she got it. But it's not that heavy and I don't think it's a full size violin. But thanks everybody that's what I thought it was. But anyways it's got a lot of character. What a lovely lovely violin. It is unique. It looks very special and handmade. What a little treasure you have. Welcome to the forum. If you ever get it set up to play it would be nice to hear. It is indeed a lovely gift. I have a weak spot for hand made wood work. It is a full size then, it measured 14"